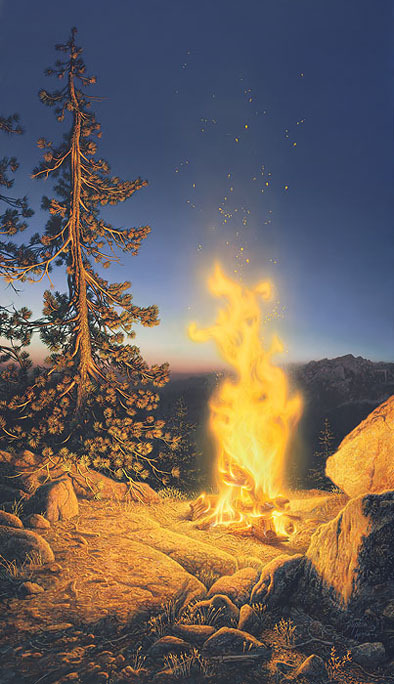 Never content to do the same thing twice, Stephen perfected painting campfires at different times of day and varying landscapes, mostly in Yosemite National Park. In Sunset Fire, the setting is late summer, most of the snow has melted from the mountains so perhaps the fire is built less for heat than to cook a meal and as an inspiration for an evening of storytelling. The vertical composition, heightened by the towering pine, seems to lift the fire and embers into the twilight sky. Your friends will want to lean in for a hint of the smoky aroma if you bring the captivating warmth and irresistible attraction of this mountain campfire into your home.